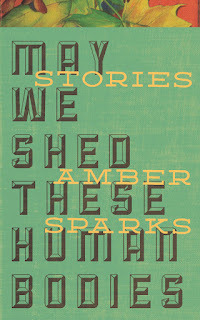 I’ve heard the stories in Amber Sparks’ debut collection May We Shed These Human Bodies referred to as fables. This is true of many of her pieces—creation myths where trees are made to become human or where life is recreated after the entire human race has a run-in with Death—but there is so much more to this collection. Much of the book spends its time in the fantastic. Alongside our fables, we find apocalyptic tales of natural disasters and zombie octogenarians. We find a magic bathtub in a grieving family’s home and a baby who thrives even while refusing food. Sparks’ talent is to ask the what ifs—what if a living child was born among ghosts, what if a city wanted to see the world? And the reader starts asking too when grabbed by first lines like, “The year the earth froze hard as diamonds and the sky rained ash, my great-grandparents met and married” or simply “Glen’s father dies in a Burger King.” Luckily for us, Sparks goes beyond asking and sends us toward surprising answers, both the serious and the ridiculous. There is a place for the fable we already know here too, like the psychological look at Peter Pan in “Never-Never” and (what I’ve dubbed in my notes here) the saddest and awesomest Paul Bunyan retelling yet in “The Monstrous Sadness of Mythical Creatures.” The important part of writing the known is finding new ways of seeing for the reader, and Sparks does the same with history, mixing the research with the anecdotal. In “The Chemistry of Objects” we see a pairing of lectures on the history of chemical warfare with scenes of the humans involved, ending with a beautiful re-seeing of one of Fritz Haber’s many tragedies. But many of these stories touch down in the real. Some of the most poignant and well-developed stories are those like “You Will Be The Living Equation” which takes us through a teenage girl’s stages of grief. In “The World After This One” a young woman tries to care for an unstable sister with only a dead mother and distant father for support, while in “All the Imaginary People Are Better at Life,” a woman refuses to deal with the problem of herself. 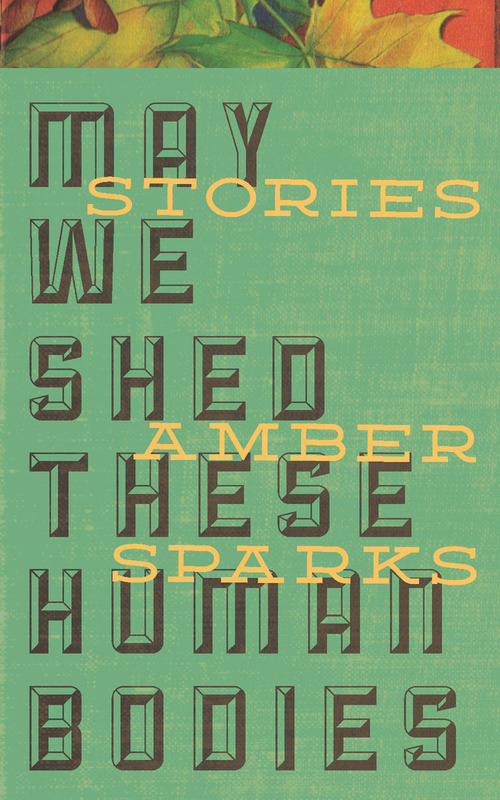 What draws all these stories together is Sparks’ use of form and narration. This is a book of pattern, whether the stories are posing as sets of instructions or archived objects, or whether they simply love the repetition of words: “Uranium. U. You wish you could”. Sparks’ prose seeks above all else to play in diction and it’s beautifully readable. This is a collection of you’s and we’s, broken up occasionally by more traditional thirds and firsts. But rather than becoming a distraction, as second person or collective third is often wont to do, these narrators follow the form and function of the stories, seeking to inform or instruct. Through these authoritative narrators we are given the “facts” of a world so different from our own. Those characters who are completely lost are given direction by matter-of-fact voices. And when we find ourselves in a more traditional narrative, we find lost characters, ones who could really use that authority. Purchase May We Shed These Human Bodies HERE.